The Little Woman Wanted Noise by Val Teal. Review: Honk, Honk! 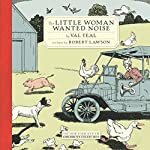 The Little Woman Wanted Noise by Val Teal and illustrated by Robert Lawson is about a little, exhilarating, old woman who moves to a farm and creates the noises she misses from the city. The Little Woman Wanted Noise is a charming book. The beginning is very descriptive and focuses on a happy, old woman who lives in the city where there is a lot of noise all around her. She doesn't mind, in fact she loves the noise. When her cousin calls saying he is moving away, he tells he that she could have the farm. This sounds like a great idea until she finds that she misses the city noises. So, the creative old woman recreates the city noises with animals on the farm; but something is still missing. I thoroughly enjoyed this book. The Little Woman Wanted Noise is an exceptional book for little kids. I'm certain that if I read it to little kids on my street, they would love it. Val Teal certainly writes very good children's books as can be seen in The Little Woman Wanted Noise. The intended audience is young children such as preschool. But even older kids, like me, will like the story as well. Robert Lawson contributes greatly as well, because his illustrations help bring the story to life. Overall, Val Teal's imagination in The Little Woman Wanted Noise goes wild, and I love that. Hopefully Val Teal will keep making books that kids love and will always love and keep making kids smile. We would like to thank Media Masters Publicity for providing a copy of The Little Woman Wanted Noise for this review. Have you read The Little Woman Wanted Noise? How would you rate it?